Emily's big day is finally here! Be Emily's special guest as her big day approaches in Delicious - Emily's Wonder Wedding Premium Edition, the exciting new chapter of the captivating series. Emily's big day is coming and you are cordially invited! Emily and Patrick are happily engaged, but when Patrick's mom arrives, bad omens begin appearing. Now Emily and Patrick are in for the ride of their lives. Is their marriage written in the stars, or will fate deal them a bad card? Find out as you follow Emily on this amazing episodic adventure. Enjoy all-new hijinks and cliffhangers as you work your way through wonderful locations; Invite Emily's friends to the wedding by completing fun challenges; Enjoy a host of new events and upgrades. A rollercoaster of love, laughs, and excitement, it's certain to keep you cheering until the very end. Critics give Delicious - Emily's Wonder Wedding 4 stars. 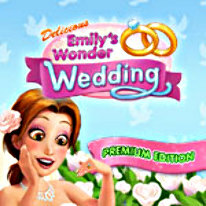 Experience it for yourself when you try the free trial version or download the full-unlimited version of Delicious - Emily's Wonder Wedding Premium Edition today! Full Version Features: This Premium Edition includes a bonus restaurant with five episodes, a musical Soundtrack, Wallpapers, and a Gallery of Emily throughout the years. Emily's big day is finally here in this all-new Time Management experience.